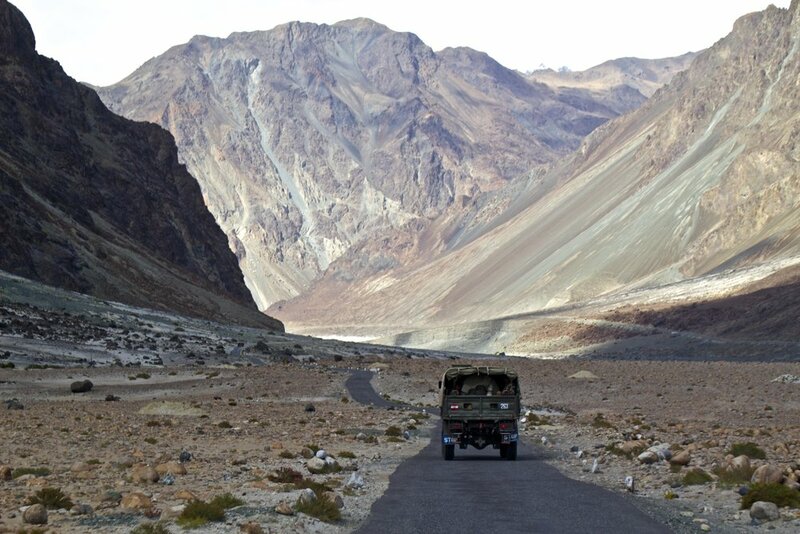 In the last article I talked about driving over the highest road in the world: Khardungla Pass. It was beyond beautiful, but it was not the destination, it was just our route. 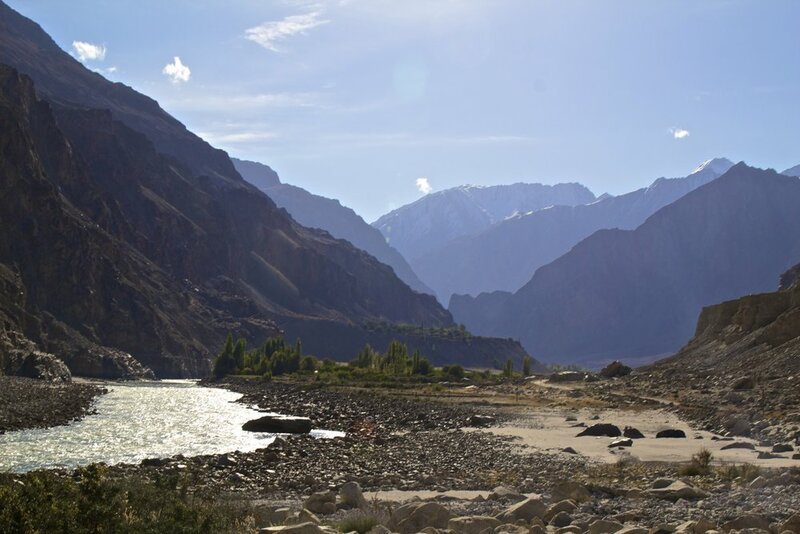 The destination of our trip had been clear from the beginning: we were headed to a little town called Turtuk. Turtuk sat almost exactly on the border between India and Pakistan. In fact, until the 1971 War between the 2 countries, Turtuk had actually been part of Pakistan. India won the war though, and in doing so, moved the border about 22 kilometers (13.67 miles). Turtuk now sits a mere 7 kilometers (4.34 miles) from the border, and has only been open for travel since 2009. India and Pakistan have a pretty troubled relationship. In fact, they were at war with one another as recently as 1999. This was the Kargil War. Kargil is a mountainous area between Leh and Srinigar. 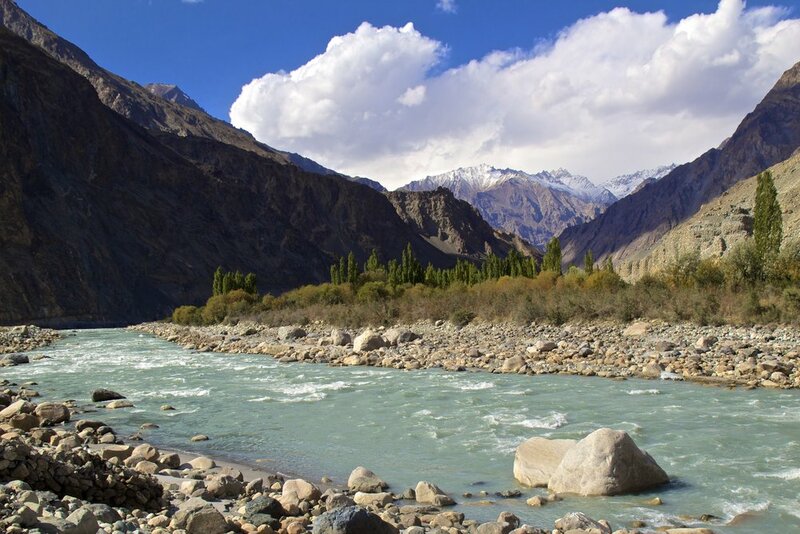 The Kashmir region, while stunningly beautiful, has been very unstable since the British pulled out leaving India and Pakistan to fight for territory. Even though the war is "over", the two countries have violent conflicts with each other in this region relatively often. So, unsurprisingly, accessing these ‘protected areas’ near the border is no easy task. Before we left Leh, we had had to apply for government permits to enter these protected areas. As we drew closer to the border, the military check points grew more frequent and more intense, but we had all our papers in order, so there were no issues. At every check point we would hand over our passports and a copy of the permit we were issued in Leh to a solider, who would keep the permit, and give us back the passports. We passed countless military bases on our way to Turtuk. Traveling with me was an Indian fellow who had been brought up in the military. As such, he had a lot of insight into what we were seeing. He told us how hard life is for the men that are stationed out here. Being stationed in Kashmir is the hardest assignment in the Indian military. Almost all of the other vehicles competing with us for space on the road were military vehicles. He saluted to the drivers and they saluted back. He could usually tell us what the trucks were doing too. Many of them were carrying soldiers in the back, and he could usually give us an educated guess of where they were going. It was actually really interesting. At one point we got out of the car together and walked over to an Indian army encampment. He talked to the officer in Hindi through the barbed wire fence for a while, and eventually asked if I could take his picture. The officer had a pretty killer mustache, but sadly, I cannot share that picture with you. Apparently taking pictures of anything related to the military is a no-no, so I tried to keep that on the D-L. It is especially true when it comes to taking pictures of actual soldiers, because they are forbidden from interacting with foreign nationals (a.k.a. me) without permission. If I post the photo and it is discovered by the wrong person, this soldier will apparently face some pretty severe penalties. He wasn’t the only soldier I had photographed by the end of the trip though, so it would seem that is a rule often broken. Eventually we entered the home-stretch of our journey to the border. We wound our way down into a narrow canyon that followed the teal colored Shayok River. The road was quickly deteriorating beneath our tires. At one point, when we had to cross to the other side of the river, our road completely gave away to sand. There were road workers around us that stopped their labors to stare through the windows at us. Eventually we had to come to a complete stop so that a bulldozer could clear our path for us. Working at this ridiculous altitude, these laborers all have very difficult lives. This area we were entering seemed to be particularly uninhabitable. Looking out the window I made eye contact with some of the laborers. They looked miserable. The drive through the canyon was one of stark beauty. The landscape was just so harsh and unforgiving. It was hard to imagine that this environment could sustain human life, but no sooner had the thought crossed my mind then our bumpy little road led us through a small village called Bogdang. This was not Turtuk, but it was still pretty. They don't get a lot of outsiders that come through, so everybody we passed seemed entranced at the sight of our jeep. It was another 20 or 30 minutes through the canyon before we finally saw Turtuk off in the distance. As we approached, the canyon grew wider ahead of us, and we saw a small collection of trees. It wasn't long before we were in the middle of those trees, and I was taken completely by surprise by what we found. 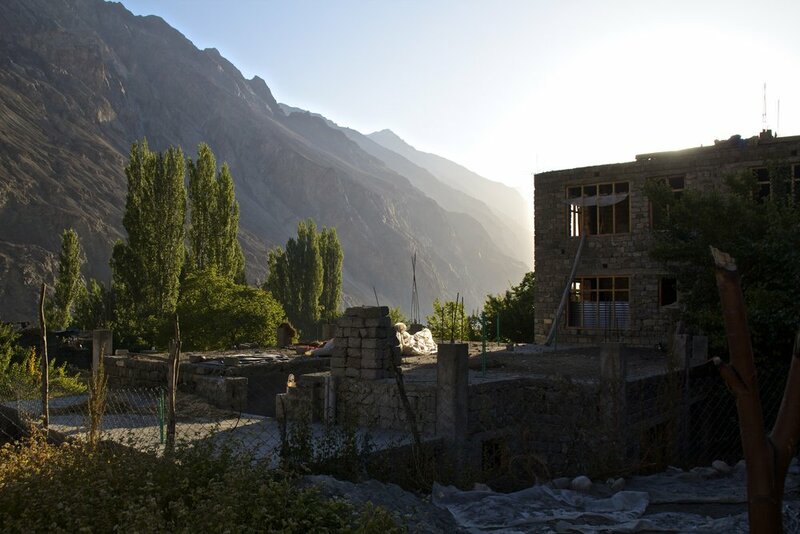 Tucked away in such a remote part of the Himalayas, Turtuk was like a lot like Shangri-La. Despite its harsh, rugged surroundings, this village was a little slice of heaven. 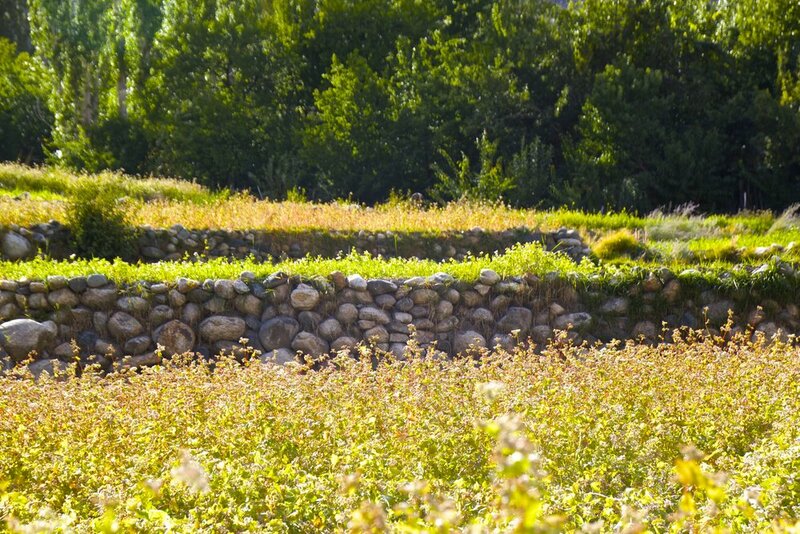 In addition to small vegetable gardens, there were also fields of brightly colored flowers, enclosed by stone walls. 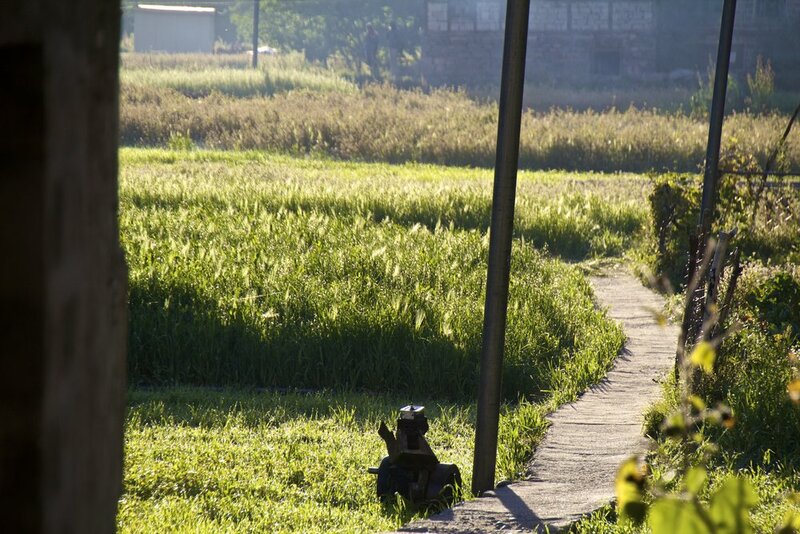 Beautiful Kashmiri people with brightly colors eyes tended to these fields and quietly led donkeys here and there. The only sound, apart from the wind, was the gentle flow of water from the nearby river. It was about as idyllic as it gets. We hadn’t been sure about whether or not to actually stay the night in this town, but it took me less than 60 seconds to make up my mind once I was there. I wasn’t going anywhere. I asked where the bathroom was and I was pointed in the direction of the river. I walked over in search of a discrete place to pee, and I went past the local high school. Teenage boys and girls walked by in their school uniforms. The boys were beginning to play a game of volleyball. The girls sat around talking in the background. I navigated through the giant rocks of the river bed in search of some privacy. On the central road of the town, a man with a mustache pointed off into the distance at a snow capped mountain. “See that mountain? That is Pakistan,” he said, frankly. Then he turned around, pointing to another snowy mountaintop, which peeked out from behind 2 brown, rocky giants. “That is also Pakistan” he said. He went on to point out which mountaintops and rocky outcroppings the Pakistanis had fired at them from during the 1971 War. This war lasted only 13 days, making it one of the shortest in history. This war is also what prompted India to get involved with Bangladesh's fight against Pakistan for independence. This man said that he was only 3 years old when it happened, but he has vague memories of hiding in a basement with his family and the sound of gunfire. He said that he and his fellow villagers were happy to now be a part of India. Culturally, Turktuk belongs to neither India nor Pakistan. 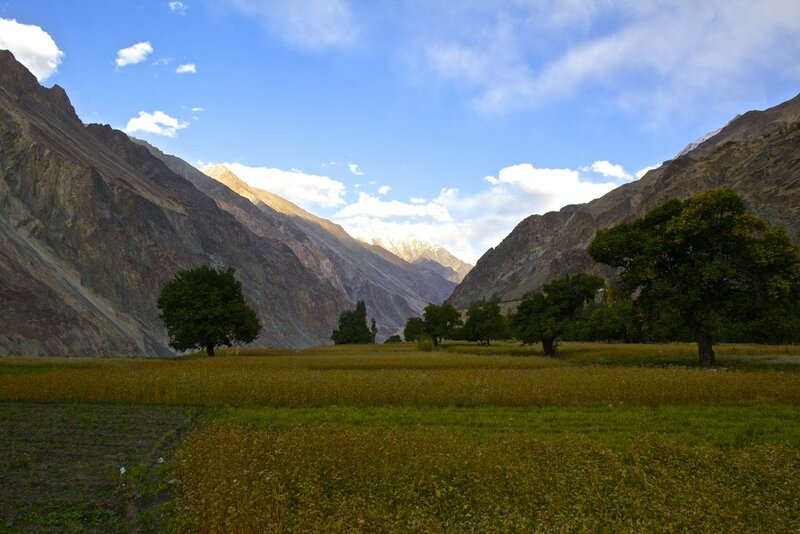 Turtuk is a beautiful little piece of a region known as Baltistan. Most of Baltistan belongs to Pakistan, but this little piece belongs to India. 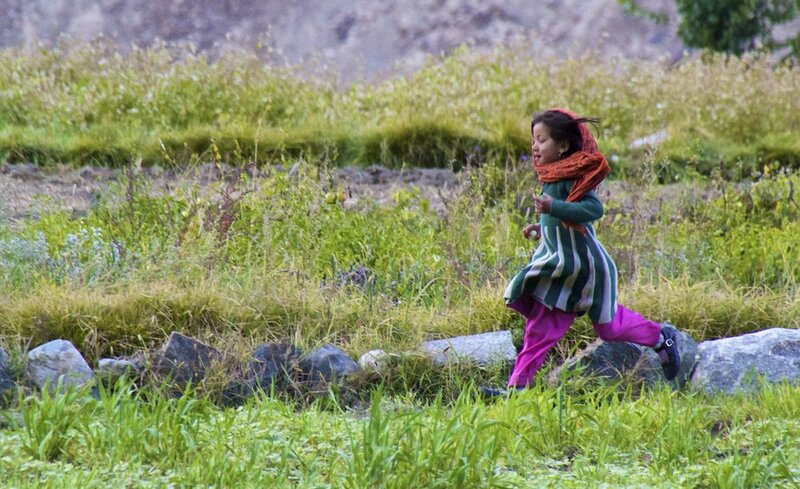 They speak Balti, which, like Ladakhi, is actually a dialect of Tibetan. However, this is where the cultural similarities with Tibet end. The village is almost 100% Muslim, and Urdu is also spoken commonly among the villagers. It really felt like Pakistan. To the British man in our group of 3, this mustached man bragged about Turtuk’s grand tradition of playing epic games of horse polo. “Noooo! Horses! BIG horses!” He retorted, holding his hands out to indicate scale. He went on to tell us of a pasture where they graze that was a 7 to 8 hour hike up from where we stood in village. We would be walking up the beginning of that hill shortly. I kept thinking about this pasture tucked away up there a midst the glaciers and snow caps. I regret not having enough time here to make the hike up there. It probably would have been amazing. Up the hill is where the bulk of the village began, as it turned out. There was a rocky creek that cascaded down the rocky slopes of the mountain. We crossed a rope bridge that swayed feebly in the wind to get over the creek, and found ourselves walking through one of Turtuk’s main “streets.” It was more like a path, and it led us through the most beautiful territory yet. Turtuk, being so isolated, was a like a step back in time. I have been to places like this before, and while they are almost always cool, they are also usually impoverished, dirty, and uncomfortable. That’s to be expected, but it was not the case with Turtuk. The village was clean, and well kept. 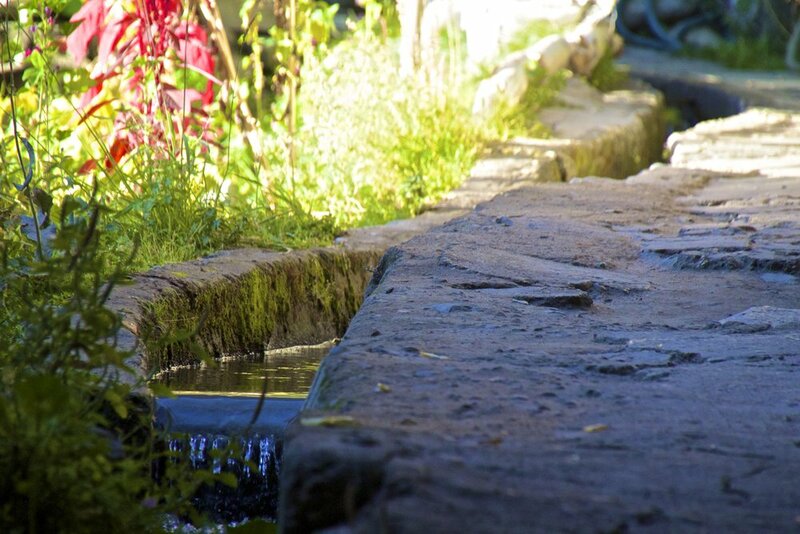 Cold, clean mountain water flowed through small cement drains that ran on either side of every path through town. Walking through town I often saw people emerge from their houses to fill up a bucket with this water, presumably to be used for bathing or cooking. A similar, but less impressive irrigation system is used in Leh. It was late afternoon at this point, and although the sun was sliding lower in the sky down towards the mountain tops, it had not yet completely vanished. 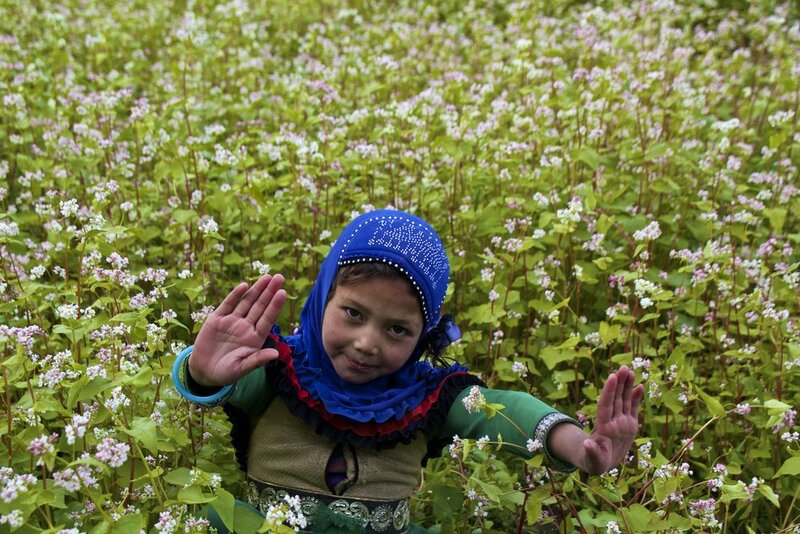 I mentioned Turtuk's flower fields earlier. The people of Turtuk seemed to be mostly subsistence farmers, as most of the space available to them was being used for agriculture. However, instead of rice paddies or corn fields, there were fields of bright red, orange, and yellow flowers. I think that the roots of these flowers are common ingredients in their meals. The way the last rays of sunlight illuminated these fields of flowers, you'd think a brush fire had been ignited. The colors were bright. Women with baskets of greenery on their backs tended to these fields while children ran through the flowers laughing. I don’t know if I’ve ever seen anything quite like it. It was fragile, and pure (if those words aren’t too cheesy). 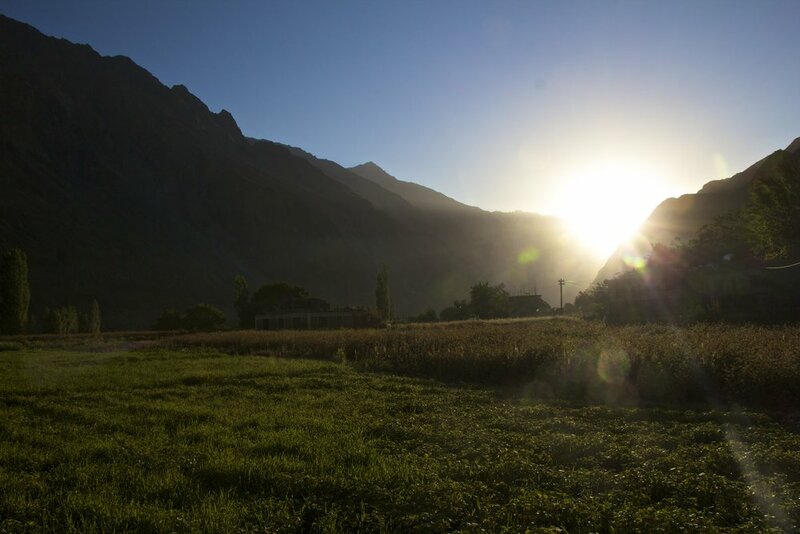 Eventually the sun slid behind the mountains, and the bright colors of the field dimmed. We found a guest house in the town for 400 INR (6.11 USD) per night that offered us a free dinner and breakfast. It was called Kahn Guesthouse. I can’t imagine there would be any way to make a reservation in Turtuk, but if you show up, you won’t be without a place to stay. Before coming here an Israeli woman I met recommended Ismael Guesthouse to me, although it was actually a homestay. I might have preferred a homestay, just for the sake of getting to know some of the locals, but this guesthouse was a nice, and the man that ran it was very hospitable. Outside the guesthouse a group of children, probably ages 6 to 8, sat on a stone wall that ran the length of the field. I sat down not too far away from them, just to take it all in. Some of them came over to me, curious as to who (or what) I was. They inspected me closely, many of them speaking to me in Balti. There was a small crowd around me, when, through the ranks of children, a small girl came up to me with a hand full of food. She was chewing on something, and which was presumably the same thing that she had smeared all over her face. She gently un-clenched her tiny fist to reveal a hand full of what looked like big raisins. She took one and held it out for me to take. "Oh, what's this?" I asked, in my animated talking-to-children voice, not expecting an answer, since none of them so far had been able to speak a word of English. "Apricot" she replied in a small, raspy voice. I was shocked! Of all the English words she could have known... apricot?? I ate it. It was, indeed, an apricot. And it was good. I would later find out that apricots grow wild in Turtuk, and are something of a local legend. So it's good that I got to try one! Many of the children were fascinated by my camera. 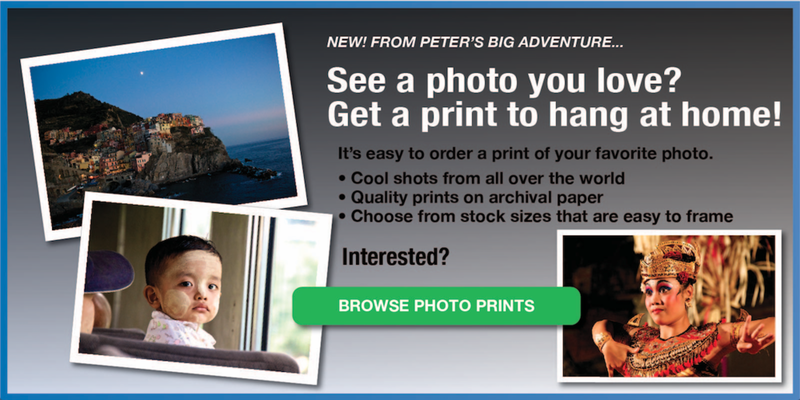 In retrospect this was a risky move on my part, but I ended up teaching them how to take photos with it. Once I let one of them hold my camera, the frenzy of grabbing children began like the seagulls in Finding Nemo. “Mine! Mine! Mine!” I sorted them out and made sure that each of them got a turn to take a few pictures. Once they got the camera in their hands there was a lot of button mashing and pictures of the ground. They were quick to take the camera from me but slow to let me teach them what to do with it. A few of them got the hang of it in the end though, and when they did, they took much more endearing photos of each other than I ever could have myself. (Of course, the photos you'll see below have been heavily cropped, zoomed, and straightened in order to get them to a presentable state.) They ran into the flower field to pose for each other, and then ran back to see their photo shoots play out on my camera screen. Eventually I had to reclaim my camera, for fear that it would end up broken. I took a few photos of them myself. We walked through the fields, passing small men and their donkeys carrying loads down the narrow paths, to the farthest point in Turtuk. It was there that we found a Buddhist temple. Constructed of sheets of metal and stacked gas cans, it was pretty shabby, but I was surprised to find a non-Muslim religious site in this village at all. Eventually night fell. I went back to my guesthouse, and asked the man if I could use his phone to call Leh. I was still trying to book a ticket back down to Delhi. The region was still without internet, so my only hope was a travel agent, whom, before I left, I had charged with the task of making phone calls to Delhi until he was able to secure me a ticket. Leh was was supposed to get its internet back that day, so I wanted to check in. The man in my guesthouse kindly obliged, bringing me up to the roof. He walked to the corner of the roof, and held his phone in the air, waiting to get reception. Eventually he got 1 bar, and I managed to make a static-filled 2 minute phone call. It wasn’t very informative though. Oh well. For dinner I was served a plate of rice, lentils, dal, and some unidentified vegetables. It was mostly quite good. Late that night, I crept back out of my guesthouse. I figured that there would be a bright sky of stars waiting for me, but I was wrong. The stars were hardly visible even visible. The moon however, was shining brighter than I have ever seen in my life. It was actually pretty strange. I looked up at the moon, but it was too bright to see any of its usual craters and textures. Instead, I had to squint in order to look directly at it. It cast a strong shadow of me on the flower fields, which followed me menacingly as I walked like something out of a Tim Burton film. It was no good for pictures, so I took a walk, and then went to bed. It was cold that night to the point that I was shivering to be outside, but inside I felt cozy and secure. The next morning I woke up early for a walk around the village. As Turtuk woke up, and the first rays of light crept back over the surrounding Himalayan ridges, I walked. I wasn’t going to find many more places like this one in my life, so I did my best to appreciate and savor the time I had left. Birds with striking patterns in their feathers flew about in the fields. The sound of the river echoed off the canyon walls as it always had. Children walked to school together in their uniforms, and brightly colored hijabs. I just wandered, the fog of my breath just barely visible in the cool morning air. 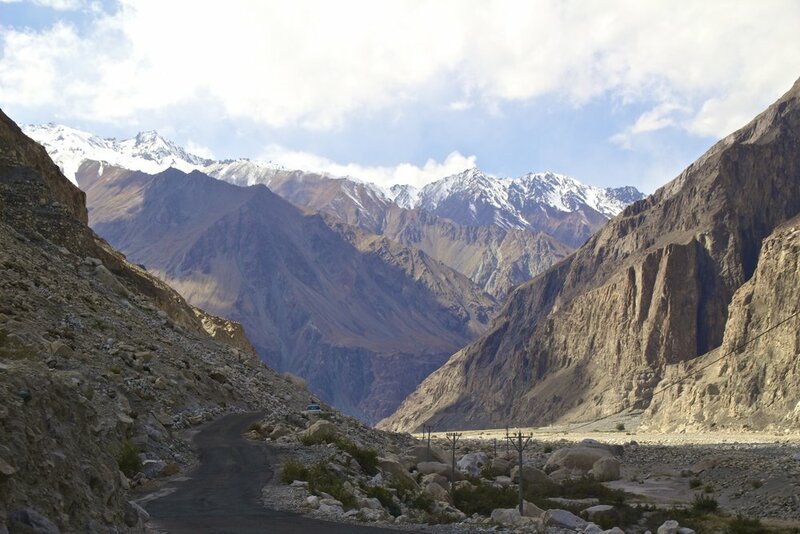 Next we’re heading to Nubra Valley where I’m going to ride a camel across the highest desert in the world. Hold onto your hats.